GLM Products, Inc. takes things a few fathoms deeper. While most aftermarket marine parts manufacturers outsource their design and production, GLM's specialty is enhancing its product line by using a highly skilled in-house design and engineering crew. The ability to design O.E.M. replacement parts that increase the reliability, performance and power of a boat is GLM's key advantage in the aftermarket marine parts industry. For over two decades, GLM has made the commitment to produce the highest quality in aftermarket marine parts. Using superior materials, the Lost Foam casting process allows GLM to produce manifolds with complex internal passages that are more durable and reliable than other types of casting technology. Lost Foam casting is also less costly than traditional casting methods, and is an environmentally friendly process, resulting in superior marine parts. For marine exhaust manifolds, an accurate cast is crucial. The uniformity of GLM's internal walls enables us to increase the water cooling area inside the manifold by 30 to 40 percent, decreasing exhaust gas temperature and lowering overall engine compartment temperature. The accuracy of the casts prevents thin spots in the internal walls that can corrode prematurely, possibly causing severe engine damage. The casting accuracy increases the life of the manifold, thus reducing costly repairs for the boat owner. By tuning the manifolds (separating the exhaust cylinders internally) GLM is able to increase the engine's efficiency, which results in fuel savings and increased power. The main purpose of the marine manifold is to cool the exhaust gases and direct them out of the engine. Excessive back pressure from an overwhelmed exhaust system will not only keep spent gases from leaving the cylinder head exhaust port, it also can draw in the spent gases from adjacent cylinders, robbing the engine of needed horsepower. Inside each of GLM's manifolds there are separate compartments that segregate the exhaust gas pulses, which produce more power by eliminating the exhaust overlap that occurs on the V-8 engines. All V-8 engines have a firing order that fires two cylinders within 90 degrees of each other on the same bank or side of the engine. Using a GM V-8 as an example, the firing order of 1-8-4-3-6-5-7-2, we have cylinders five and seven firing on the port side of the engine within 90 degrees of crankshaft rotation. This means that the exhaust gases for these cylinders immediately discharge into the exhaust manifold one after the other. On the starboard side, we have cylinders four and eight firing in succession with cylinder six acting as a buffer between the two, so the overlap is not as prevalent on this side of the engine. All GLM manifolds incorporate the isolated runners to keep the exhaust gases separate and produce maximum horsepower. During independent testing conducted by Family and Performance Boating magazine, GLM manifolds outperformed the stock manifolds in several categories including planing time, where the GLM manifold was able to reduce the time it took the boat to plane by six seconds, as well as top speed, where the GLM manifold gained approximately two and a half miles per hour on the radar gun (for complete text, visit www.glmmarine.com/manifolds/asseenin.html). With the GLM manifolds, you get the benefits of a high performance manifold without the high cost of custom exhaust systems. GLM manifolds are cast as 100 percent original equipment replacements for MerCruiser, Volvo and OMC as well as several other major manufacturers, so that means no modifications or alterations are necessary. They are truly "bolt-on" high performance replacements that offer the consumer the performance and reliability needed to withstand the harsh demands of the marine environment. With GLM parts, dealers can provide their customers with high quality replacement parts at a substantial savings over the original factory parts. With GLM's lower costs and higher margins, you can add more profitability to your service department and reduce the repair costs to the boat owner. Headquartered in Monrovia, Calif., GLM has a worldwide network of distributors that can provide the parts and technical support. 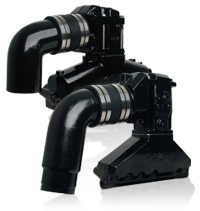 All cast iron GLM manifolds and exhaust elbows carry a three-year limited warranty. That's what makes GLM a leader in aftermarket technology. GLM invites distributor candidates to contact the company directly to discuss the opportunity to become a GLM Distributor. Marine dealers should contact their local marine distributor to inquire as to whether they offer the GLM product line. If not, they can contact GLM directly to locate a convenient distributor.